The Detroit Department of Transportation offers real-time bus service available on iPhone, Android, and Twitter through a new app called Stop313. 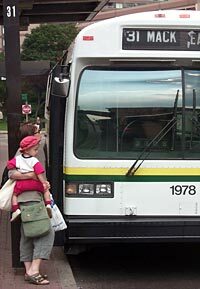 It focuses on conveniently meeting the needs of our bus-riding passengers in Detroit. The creator of Stop 313, local technologist Evol Johnson-Winter, designed the free app to assist customers in targeting bus routes and real-time bus arrivals within DDOT's fixed-route service area. In addition, the Stop 313 app complements DDOT's TextMyBus SMS service, which is available by sending a text to bus-stop locations to 50464 or (313) 499-0937. The Stop 313 app is available on Google Play. It is your Warrendale Tip of the Week for the week of April 1, 2013. It is always interesting to check in and see what you have to share. I always learn a lot!